Against the odds, former township kid Luvo Ntezo put in hard slog, learnt new skills and was eventually rewarded with a couple of lucky breaks. Kim Maxwell follows the career path of this hotel wine sommelier. But after six months, Ntezo had a chance encounter that changed his career. ‘I remember waiting on an English family,’ says Ntezo. ‘Most of our poolside guests just ordered a glass of wine from the bar, but this particular family ordered a bottle. I had never opened a bottle of wine before, and after trying repeatedly, I had to ask the family for help.’ The next day Ntezo went to Steenberg’s then-winemaker John Loubser, and asked to learn more about wine. ‘When John took me under his wing, it was such a thrilling thing. I thought to myself: they pick these grapes, and they make this wine I can’t even pronounce. If a guy can say a polished name like “Cabernet Sauvignon’” why can’t I?’ Ntezo was soon hooked on wine. ‘John helped me understand that there are grapes called Sauvignon Blanc and Chardonnay and Merlot. He introduced me to the tanks and barrels used to make them into wines, and to the amazing flavours we learn to pick up when we taste them,’ says Ntezo. ‘Working at Steenberg, I was given a complimentary meal every day, and had an opportunity to grow and learn. It was almost like a school to me,’ says Ntezo. Although most of his salary funded his transport to work, Ntezo valued the learning opportunity. 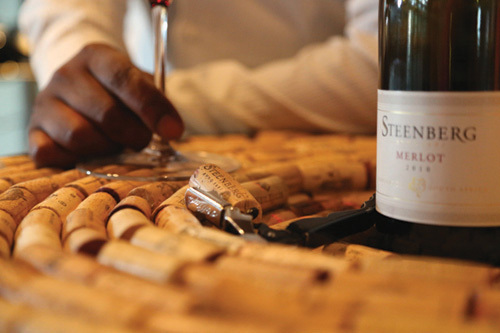 In his previous job at Steenberg, Ntezo had often sipped wine with winery staff after work. To test his knowledge, they had called his bluff with faulty or tricky wines. A few months into the Twelve Apostles job, a similar situation came about. ‘I was polishing glasses during a staff wine training seminar, when the winemaker offered me a taste,’ says Ntezo. ‘The staff were all admiring the wine with positive comments. But when he asked me what I thought, I said the bottle was corked.’ Ntezo’s assessment was spot on; the wine was indeed faulty, spoiled by ‘off’ flavours of cork taint. 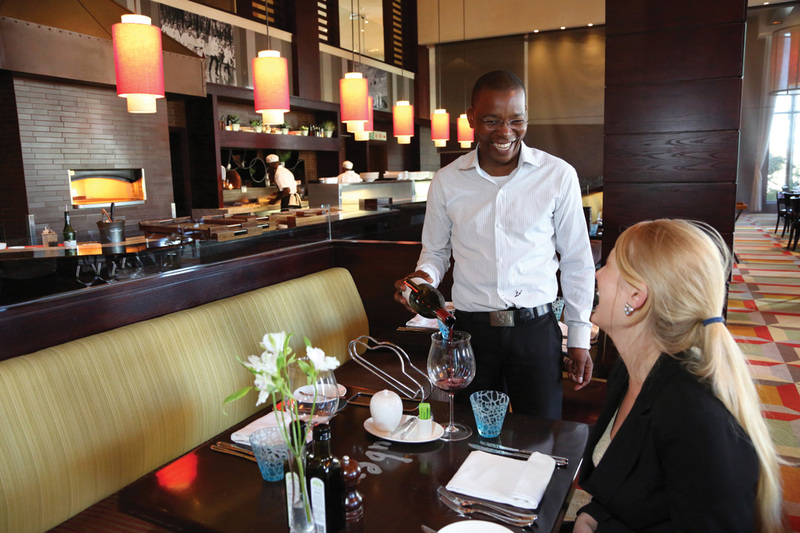 Word quickly spread to the general manager, and Ntezo was offered a promotion to trainee wine sommelier. The hotel also offered a salary increase. But Ntezo instead requested the same salary, plus sponsorship of wine courses. An agreement was reached, and Ntezo continued his unglamorous glass-polishing job, swotting up on wine in between. Key moments during that period included travel to Europe for further training. ‘For the first time in my life, I went to an airport, and I flew from Cape Town to London Heathrow. I was about 22. I also caught my first British train in Waterloo – alone – and went to Dorset.’ Ntezo was mentored for a month at the Red Carnation Summer Lodge in Dorset by the UK’s ‘sommelier of the year’ Eric Zwiebel. He also spent two weeks training at another London hotel. 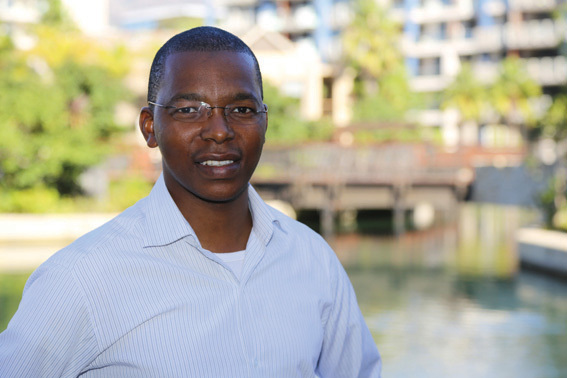 Ntezo was promoted to wine sommelier at Twelve Apostles hotel in 2006. In 2008, he participated in the ‘young sommelier‘ national Chaîne des Rôtisseurs wine competition in SA – and took first place. In the same year, he competed in the international leg of the competition in Vienna, where he ranked fourth globally. ❱ If you’re in Matric, go to the library and get hold of a wine book. Start reading with an open mind. Ask your school to contact hotels in your area to see what opportunities exist. ❱ Hotels such as the One&Only Cape Town can often secure funding if township kids are keen to learn – they sponsor various development projects. ❱ Volunteer to shadow a sommelier on the floor, and observe what he or she does. You might decide the job’s not right for you or the hours are too long. ❱ Look and act the part. Sommeliers wear suits and ties. I believe that if you’re late for school, you’ll be the same at work. If you’re unkempt at school, you will be unkempt at work. ❱ A head sommelier is the head of a team involved with wine. That team becomes the face of the restaurant (or multiple restaurants, in a hotel). A head sommelier nurtures a team of sommeliers with wine tastings and refresher classes. We work with a lifestyle beverage that is hugely expensive, so we also train personalities – it’s an opportunity to change for the better, which helps people in their jobs. A very neat, crisp, well-groomed human being is a very confident person inside. ❱ A good sommelier needs to be hospitable from within. Be a good listener. You’ll deal with challenging guests and will need to understand their needs. If you pretend you’re happy doing that but you’re not, it will be visible to others. Have patience in dealing with people, and a sense of urgency in doing your job. ❱ A good sommelier is like a sponge, absorbing knowledge. A sommelier needs a good ‘nose’ (ability to identify aromas) for tasting wine – but those skills can be trained. A bit of muscle to carry boxes of wine up and down stairs is also handy. ❱ I like very simple food. I’ve spent a lot of time in Durban, so I like Indian curries. I enjoy Cape Malay food too. I also love braais and beer and friends; I’m a meat man. I like to braai myself, but when it comes to the kitchen, I have to admit that I’m a bit of a cowboy. ❱ My favourite wine is Chardonnay – the bolder the better. And any good Pinot Noir works for me too. ❱ I’ve travelled to London, and also to Austria, Canada and the Middle East, where I participated in sommelier competitions. I’ve seen a bit of the USA and Canada during a Wines of South Africa road show, where we talked about South African wines and food at various events. ❱ I’m a big fan of Meatloaf. I also like listening to the Parlotones, Black Sabbath, Coldplay and Kings of Leon. For soothing purposes I’d probably listen to Vangelis. ❱ When I have free time, I put down my Renault Megane rooftop, and I drive to Kalk Bay for fish and chips. Interested in becoming a Wine Sommelier? Visit Post Matric’s wine sommelier career page for a career overview, qualifications needed, where to study, school subjects required and a career interview. ← Marlin Rhode – driven to succeed Guidance: Where to next?